It’s an amazing experience to enjoy some of the major Venice attractions, that is its most prestigious and lavish palaces, from a stunning perspective, the Grand Canal. 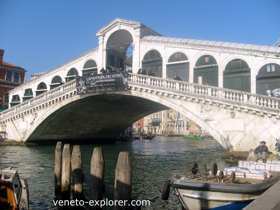 The S-shaped main canal of Venice is 5.8 Km/3.60 miles long, and splits the Veneto town in two parts. The ambassador of France in 1495 went into raptures over the superb beauty of its overlooking buildings. In fact it is a pleasure to the eye. The more you approach San Marco Square, the more sumptuous the palaces are. I am going to mention a few of the things worth seeing in the Grand Canal, in order of appearance. I want to begin with one of the most recent of the Venice attractions. However, it’s a bridge, not a palace. It is about the Calatrava bridge, after a design by the spanish architect Santiago Calatrava. It has been inaugurated in 2007 and placed just in front of Piazzale Roma, the gate to the town from the mainland. It sounds odd speaking about contemporary architecture for a town which bases all of its appeal on history and on well preserved architectural harmony. I remember this plan arousing controversy among expertsfor this reason. Personally I don’t object to pieces of contemporary architecture placed here and there inside old towns, provided that they are well balanced and in the right places. Like in this case...just my two cents. You will then see at your right the Fondaco dei Turchi(warehouse of Turkish). It’s a unmistakable building, with wide arcades on the base. It was sold by the Venice Republic to the Ottoman merchants. The fondaco - from the Arabic funduq, meaning warehouse - was common in the main ports of the Mediterranean, like Genua, Naples and Alexandria in Egypt. It was used by the foreign merchants to store their wares and as a lodging for themselves. Moving forward,you will see on your left the Palazzo Vendramin Calergi, a renaissance building dating back to the early 1500. The german musician Richard Wagner lived in this venetian building for two years, until he passed away in 1883. Further ahead on your left, you will notice another of the Venice attractions in the Grand Canal, which is the stunning Ca’ d’Oro, (golden house). It shows the typical venetian architecture, that is a blending of venetian-byzantine and gothic style. It was built at the end of the Middle Ages, in the first half of 1400. Its name comes from the very thin gold foils which in the past decorated its external walls. After the first Grand Canal right-hand bend, the Fondaco dei Tedeschi(Fondaco of the Germans will pop up. In the golden age of the Venice republic it was the headquarters of the german merchants. For many years in the latter decades it was the seat of the Venice main Post Office. It was recently sold to the Veneto-born clothing company Benetton Corporation. After a while you will pass under the celebre Ponte di Rialto (Rialto Bridge), the oldest and most unique bridge of the town, for sure one of the most recognizable of the Venice attractions. The original bridge, dating back to 1175, was built on boats. Later on, the boats were replaced by wooden piles. The final one dates back to the second half of 1500, and it is made of stone. Its two lateral arcades house some stores. Steaming on across the canal other elegant old palaces come to the view. I will mention just a few. Ca’ Rezzonico, on your right, now the venue of a museum about the 1700’s Venetian paintings. Then Palazzo Grassi on your left, nowadays the venue of the most prestigious art exhibitions which take place in Venice. , which in 1500 was considered the most prestigious venetian private home. In the last stretch, before flowing into the San Marco basin in front of the big San Marco square, you will see the baroque Church of Santa Maria della Salute. In the canal’s extreme right top you will find the old Dogana de' Mar. (maritime customs house). I recommend that you take this Grand Canal Tour (which is not expensive at all)if you want to appreciate with a global view some of the most stunning architectural Venice attractions. For the Grand Canal Tour take the vaporetto line #1, which connects the Train Station and Piazzale Roma (the gate to the old town) to San Marco Square.